The other critical roads include extension of Chhattarpur and Mandi Road for better connectivity to Gurgaon and new connections from Noida and Faridabad. “Minister of Urban Development Venkaiah Naidu has asked the Delhi Development Authority to engage a consultant of international repute to prepare feasibility reports for the proposed roads,’’ a senior UD official said. DDA will also promote the country’s first cycle-sharing system at Dwarka sub-city. This system will cover an area of 65 sqkm. It will include 300 cycle stations which will have modern smart-card based interface, computerised docking facilities and women friendly cycles. “Tenders have been floated to chose the vendor and this facility will be fully functional within one year. Naidu wants Dwarka sub-city to have a world-class cycle sharing system,’’ an official said. Five world-class integrated passenger terminals in the form of transit hubs will be developed to provide seamless integration between airports, railway stations, local Metro stations and buses with feeder services for last-minute connectivity. These terminals will come up at Anand Vihar, Sarai Kale Khan, Dwarka Sector-21, Tikri Kalan and Kashmere Gate. The Delhi Development Authority (DDA) has started construction work on an ambitious road project that promises to decongest the Capital’s roads. As per the Master Plan of Delhi 2021, the Capital will get three urban extension roads with a total length of more than 150 km. These three concentric ring roads will pass through the peripheral areas of northwest and south Delhi, joining national highways 1, 10, 8 and 2. Thanks to these roads, vehicles not bound for Delhi but only passing through the city will not clog the main roads. Also, Delhiites driving out of the city would be able to get on one of these roads to reach any of the national highways faster, instead of meandering through inner roads. Though the project has been in the pipeline for quite some time now, the DDA has finally started construction of the longest of all the three roads, the urban extension road 2. Starting from the Wazirabad bypass, it will connect NH-1, 10, 8 and 2. “Construction on the UER 2 has begun and will be completed in different stretches. It is the biggest of the three roads and all the three roads are expected to be completed by 2015,” said a senior DDA official who didn’t wish to be named. “Work on the other two roads is stuck due to encroachments along the route and also because land is yet to be acquired,” he said. The DDA is going to hold a meeting next week with other land owning agencies and civic bodies to find a way out. “Though the roads are meant to bypass the city and will come up in the periphery, they still pass through some very congested residential areas. That is why getting the required land had been a problem,” he said. One of the ideas, however, that DDA is toying is with is to build elevated stretches in such areas. Commuting across the length and breadth of the Capital is soon going to be a different experience altogether as one will be able to reach National Highway (NH) within 10 minutes from any part of the city. In an ambitious project, the Delhi Development Authority (DDA) has approved three link roads to provide road network in the city in bordering area for connectivity with neighbouring States. This project has been stuck failing clearance from the agency. These link roads will facilitate smooth travelling between two States — Delhi and Haryana — Dwarka-Palam Vihar, Najafgarh-Dhansa and Nelson Mandela Road-MG Road. While announcing the development, DDA vice-chairman GS Patnaik on Tuesday said these roads have been added in Zonal Development Plan now though they were there earlier. “These have been approved and the Government may start construction work soon,” he said. Patnaik also added keeping in mind the ever-increasing vehicular population in Delhi, the DDA has envisaged another ambitious project to decongest the city with creation of three Urban Extension Roads (UERs). Under the project, three connecting carriageways between four highways will be constructed. Recently, the agency has also cleared three link roads. He also said, “The idea is to reach highways within 10 minutes from any part of the city. Of course, there are issues on unauthorised colonies and land acquisition in those areas where these pathways are to be constructed, but that would be resolved,” he said. The senior official of the agency said as major development in the region (bordering area) had been planned; only last village would be left as green area or agricultural land. “This is being done under pressure as across the border in neighbouring states there have been intense development. Bordering areas would be urbanised. 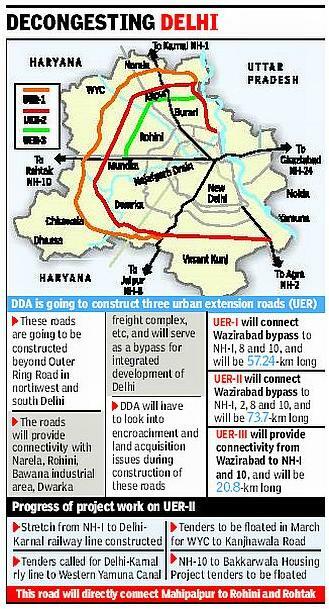 DDA has already undertaken construction of UERs to provide connectivity from NH 1 to NH 8 and NH 10- NH 2. UER I, UER II and UER III are under progress,” said Patnaik. Under the project, a road from NH 8, NH 10 and NH 1 to Wazirabad bypass will be constructed which is UER I. Another road will connect NH 1, NH 2, NH 8 and NH 10 to Wazirabad bypass as part of UER II. UER-III will help provide connectivity from Wazirabad bypass to NH-I and NH-10. The VC of DDA also said a study in Karkardooma and at MG Road is being conducted by Delhi Metro Rail Corporation (DMRC) to explore the possibilities of carrying out development under Transit Oriented Development programme — developing housing units and offices complexes along the Metro or mass transit corridor as proposed by the Ministry of Urban Development. “We are waiting for the recommendations,” he added. Contrary to the view of the Delhi Chief Minister Sheila Dikshit pertaining to the vertical expansion of the city, Patnaik said the city needed mixed growth, vertical and horizontal. Though, Union Urban Development Minister Kamal Nath recently insisted on vertical growth being the only answer to Delhi’s problems of ever-increasing population. “I think it has to be a mix of both types of growth. If there is dearth of sources, there should not be vertical growth,” he said. Patnaik also announced that in next three years, DDA will provide one lakh dwelling units to economically weaker sections and lower income groups. It was announced that a ‘Golden Jubilee Park’ would come up on the western bank, which is part of its Yamuna River Front Development project. Having an area of 251 hectares, it will have amphitheater, plaza, information centre, exhibition space, food courts and children play area. Patnaik said a socio-cultural centre on the lines of the India Habitat Centre in Lodi Road would be constructed in Dwarka Sector 19. The vice-chairman said landscape development of Barapulla drainage is on and in the first phase, 4.6 km from JLN Stadium to Sarai Kale Khan will be taken up. Delhi's growth and expansion would now take place in the border areas where the Capital's peripheral villages would be urbanised, according to the Delhi Development Authority (DDA). GS Patnaik, who completes a year as DDA's vice-chairpersonon January 10, said on Tuesday that these urban extension areas would be connected with better roads, while taking stock of DDA's achievements in 2011 and its future projects. The urban extension areas comprise Narela, Rohini Extension, Dwarka Extension, Kanjhawla, Bakkarwala, etc. “We want to connect these areas to highways like National highways (NH) 1, 2 and 8. We are constructing three urban extension roads that would be like concentric ring roads connecting to highways,“ said Patnaik. “The idea is that people living in these areas would be able to reach the highway in 10 minutes,“ he added. These roads will connect farflung and upcoming peripheral areas of Delhi without relying on the city's arterial roads. Patnaik said the review of Master Plan of Delhi 2021, which was notified in February 2007, will continue in 2012. “We have formed 17 management action groups and an advisory group under the chairmanship of the LieutenantGovernor has also been constituted,“ he said. DDA has received more than 2,000 suggestions from the public, which would be examined by the advisory group. Speaking on the 400-odd flats able for that. New Delhi: The plan to decongest arterial roads in the city is finally taking off with Delhi Development Authority receiving a go-ahead for the construction of three urban extension roads (UER) provided under Master Plan 2021. As part of these UERs, DDA will build two major bypass roads connecting NH-8 and NH-2 to Wazirabad bypass that will facilitate traffic from Gurgaon and Faridabad to zip through the city without hitting the already congested Ring Road. While the 57.24km-long road from NH-8 to Wazirabad bypass is already under construction as part of UER I, another road will connect NH-2 to Wazirabad bypass as part of UER II. This second road will be 79.12km-long and 100m wide. The plan to build these roads in different phases was approved in the governing body meeting of DDA on Tuesday. Sources said these roads are likely to be completed by 2015. While the first and third UERs will be 80m wide, the second one will be broader at 100m. Another bypass at Najafgarh was also approved by the governing body to decongest the area and improve connectivity with the villages located there. Rajesh Gehlot, MCD councillor of Najafgarh zone and a non-official member of DDA, said, “This bypass is going to be a peripheral road around Najafgarh which will solve the problem of traffic congestion and long jams in the area. The L-G has directed DDA to take up the work on top priority.” Gehlot said there are over 100 villages in the Najafgarh area which often remain cutoff from the main city due to jams that last for seven to eight hours. The road will be built from Sai Baba Mandir on Najafgarh Road towards Bijwasan-Chhawla Road. It will be go through Dhansa road, Jharoda Road, Nangloi Road hitting the Najafgarh Road again. DDA has also approved a scheme to relocate and rehabilitate people dislodged due to the construction of UERs. According to DDA, those whose shops, residence, workshops or industrial units get affected and they have to yield space for the project will be eligible for allotment of EWS, LIG or MIG flats or plots depending on the area they have to give up. 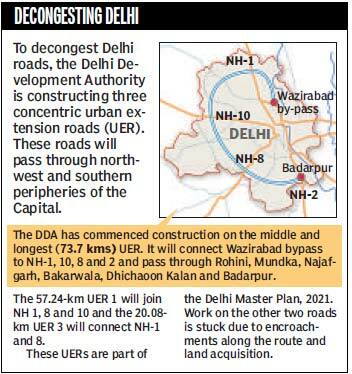 New Delhi: To decongest Delhi's main roads, Delhi Development Authority (DDA) has started work on three urban extension roads (UER) beyond the outer Ring Road in northwest and south Delhi. These roads will serve as a bypass for integrated development of Delhi, according to DDA officials. While these projects were conceptualized several years ago, work could not be started due to problems related to removal of encroachments and land acquisition. The first road will connect Wazirabad bypass to NH-I, NH-10 and NH-8 while UER-II – which is the longest road – will connect Wazirabad bypass to NH-I, NH-10, NH-8 and NH-2. UER-III will help provide connectivity from Wazirabad bypass to NH-I and NH-10. 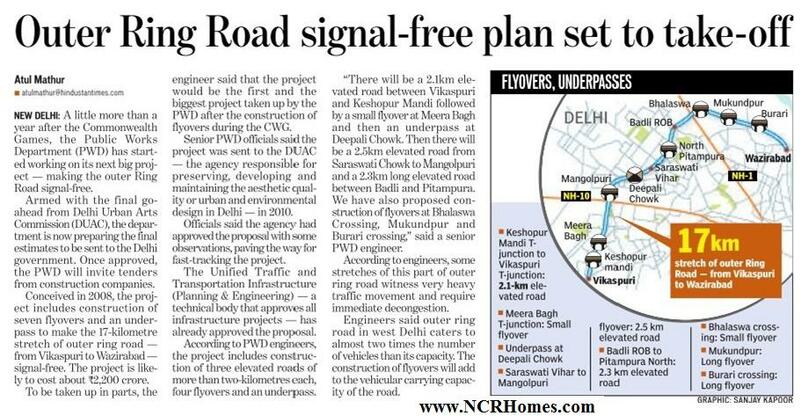 "These roads will not only improve connectivity but will also take the traffic load off Delhi's arterial roads. The three roads will serve as direct links from Mahipalpur to areas like Rohini, Rohtak Road, Narela etc. Once these roads are constructed, motorists travelling from Gurgaon or Dwarka will be able go directly towards Rohini," said a DDA official. At present, there is no proper road network connecting all these national highways. According to the land agency, work has already begun along UER-II. "As far as UER-II is concerned, work will be taken up on four stretches immediately. While the stretch from NH-I to Delhi-Karnal railway line has already been constructed, tenders are being called for the portion from Delhi-Karnal railway line to Western Yamuna Canal (WYC). The tenders for the stretches from Western Yamuna Canal to Kanjhawala Road and from NH-10 to Bakkarwala Housing Project will be floated next month," said DDA spokesperson Neemo Dhar. Issues like encroachments and land acquisition along the proposed routes have been creating hindrances to the smooth progress of the projects. "There are encroachments on these routes and these issues will have to be resolved. We will also acquire land and look into rehabilitation issues. This will take another three to four months," said an official. On UER-I, while some portion of the stretch has already been constructed, there is some problem due to which work cannot be taken up along 2.5km of the stretch. On UER-III also, there are encroachments along NH-10 to Kanjhawala Road. Work of constructing the road beyond this area has been started by DDA. "The road from Kanjhawala to WYC is being constructed while tenders will be called for the stretch in the Rohini zone soon,'' said an official. According to DDA, since this is a large-scale project its completion will take time. "These roads are Master Plan roads and will also connect Narela, Rohini, Bawana industrial area and Dwarka freight complex," added an official.